A stay at Atlantic Palms Hotel Suites & Condos places you in the heart of Myrtle Beach, a 2-minute drive from Family Kingdom Amusement Park and 6 minutes from SkyWheel Myrtle Beach. This beach hotel is 2.9 mi (4.7 km) from Coastal Grand Mall and 3.7 mi (6 km) from NASCAR Speedpark. Make yourself at home in one of the 129 air-conditioned rooms featuring kitchenettes. Flat-screen televisions are provided for your entertainment. Conveniences include coffee/tea makers and irons/ironing boards, as well as phones with free local calls. Dip into one of the 2 outdoor swimming pools or enjoy other recreational amenities including a lazy river and a 24-hour fitness center. This hotel also features complimentary wireless Internet access and a television in a common area. Enjoy a satisfying meal at Maestros Dining & Bar serving guests of Atlantic Palms Hotel Suites & Condos. Unwind at the end of the day with a drink at the bar/lounge or the poolside bar. 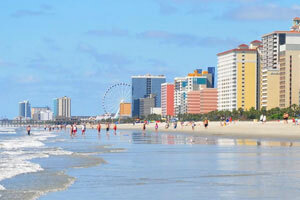 The preferred airport for Atlantic Palms Hotel Suites & Condos is Myrtle Beach, SC (MYR). The property is closed between 25 November and 20 February. Only bookings from non-local guests are accepted. Guests whose residence is within the same county as the property will not be allowed to check in. Please note that cultural norms and guest policies may differ by country and by property. The policies listed are provided by the property.